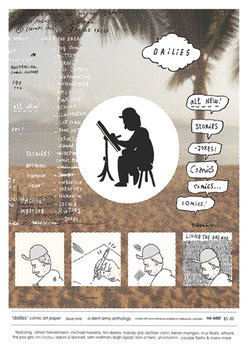 Dailies was printed 2012 - 2014 asking friends to draw a comic about their day (comic artist or otherwise). Tom Civil, Aaron O’Donnell, Tim Molloy, Georg, Marc Pearson, Ha-Ha, Picnick, Shida, Nelio, James Bonnici, Anthony Woodward, Texta Queen, Jerome Bihan, Adi Firth, Rachel Torbett, Dan Reed, Pip Stafford, Mel Roswell, Sam Wallman, Clint Cure, Karl Wills, Rena Littleson, Leigh Rigozzi, The Pox Girls, Mandy Ord, Simon Hanselmann, Michael Hawkins, Tom O’Hern, Jo Waite, Lucy Berglund, Ted McKinley, Cougar Flashy, Anthony Lister, GhostPatrol, Twoone, Baby Guerilla, Athonk, Ben Hutchings, Glenn Smith, Dan Sibley, Psalm, Mitten Fortress, Tim Sterling, Phoenix, Michael Managhetti, Benard Caleo, Hamishi, Ed Wakeham, Alec Morten, Lwnski, Heesco, Clayton Noone, Indira Neville, Ero, Toni Dowd, Dan Fikaris, Jase Harper, James James, Carol Wood, Lachlan Conn, Kieran Mangan, Tim Danko. Tim Danko, Al Stark, M. P. Fikaris, David Ghostpatrol, Tim Molloy, Tom Civil, Jo Waite, Kristin McIver, D.C. Mahler, B.D. Caleo, Pheelix, Callum Donoghue, Athonk Sapto Raharjo, Jase Harper, S.D. 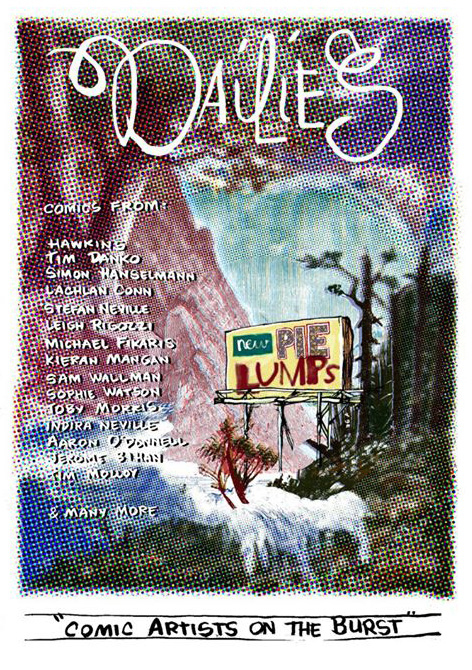 Dodds, James Bonnici, Mike Makatron, Andrew Fulton, Caroline Ierodiaconou, Texta Queen, Clint Qray, Marc Pearson, Mandy Ord, Simon Hanselmann, Michal Hawkins, Grant Gronewald, ...Sam Wallman, Aaron O'Donnell, Glenn Smith, Leigh Rigozzi, Stewart Cole, Michael Meneghetti, Mel Rowsell, Fred Fowler, Cecilia Fogelberg, Joel Gailer, Bastian, James James, Dan Cross, Dan Sibley, Time Sterling, Girl Mountain, Tonez Dowd, Mars Monsta, Peter Fraser, Baskoro Latu, Seb Fransz, LachLan, K.J. Mangan. 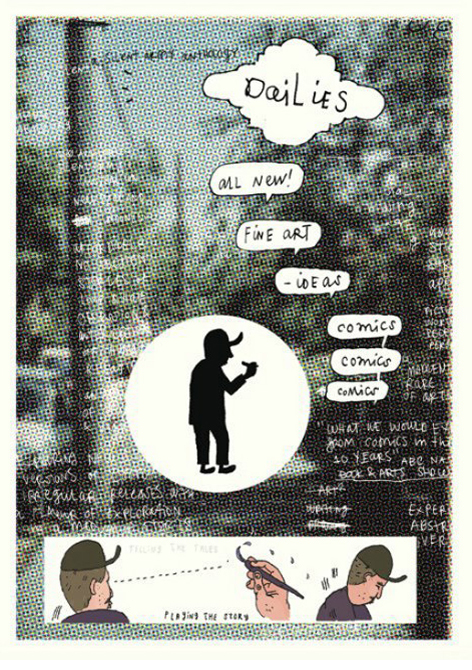 Kieran Mangan, Leigh Rigozzi, Sam Wallman, Tom O'hern, M. P. Fikaris, Simon Hanselmann, David Ghostpatrol, Rachel Torbett, Brent Willis, Sarah Laing, Duckling Monster, G-Frenzy, Ralphi, Jerome Bihan, Stefan Neville & Clayton Noone, Jessica Dew, Chris Cudby, James James, Tokerau Wilson, Tim Molloy, Edward Gains, Sophie Watson, Indira Neville, Esther Galloway, Lucy Spike Danko, Wilco Gains, Tim Kidd, Alex Wild, Toby Morris, Corn Stone, Demarnia Lloyd-Harris, Glenn Ross, Crystal Diamond,Tim Danko, Michael Hawkins, Dave Mahler, Clint Qray, MPF & Dan Cross, Aaron O'Donnell, Anthony Woodward, Klara, Mervin Heers, Dan Sibley, Lachlan Conn.
Ghostpatrol / Jagi , Magic Sweater, Jase Harper, Okta Samid , Jerome Bihan , Al Stark , MP Fikaris , Hawkins Leigh Rigozzi , Chris Cudby, David C Mahler, Herry Choi, Katie Parrish , Joanna Anderson, Evie Cahir, Dan Sibley, Baby Guerilla, Amber Carvan, Stabs, Psalm , Hancock , James Bonicci , Heesco , Nicholas Ives, Glenn Smith, Sam Wallman , Andrew Weldon, Gregory Mackay, Dan Cross, Clint Qray, Toby Morris, Tom O’Hern, Oik Wasfuk, Stewart Cole, Ross Tesoriero, Seb Fransz, Callum Donoghue, Regan Tamanui, Indira and Stefan Neville, James James, Emma Songdahl / Aaron O’Donnell, Stuart Stratu, Cecilia Fogelberg / Athonk Sapto Raharjo, Tim Molloy, Katja Mouvlin, Merv Heers, Kieran Mangan , Joel Gailer, David Blumenstein, Mandy Ord, Tegan New, Nick Potter, Ryan Ady Putra, Simon Hanselmann , Tim Danko.